Formed in Scarborough, ON in late 1981, the band's origins started when Andy McLean, a Brit holidaying in Canada met fellow guitarist and vocalist Gary Brown. They struck a friendship and Brown soon introduced him to some friends he'd just formed a band with, drummer Derek Gassyt, bassist Lewis Mele and Fraser MacDougall on keyboards. Literally within weeks they began doing the local circuit around Toronto. Capitalizing on the new wave sound of the day, they were noticed by manager Dave Kirby and signed with CBS Records practically overnight, having only played a couple dozen shows as a band. By the time they entered Phase One Studios the next year, Brown and McLean had collaberated on a couple dozen tunes. Produced by Paul Gross, the band's self-titled debut was released in early 1983, and contained an off-the-cuff live feel the execs thought properly represented the band, which it didn't. Feeling the pressure to keep the album to its originally intended low budget, the best of the bunch were picked. The album was filled with simple hooks and melodies put to even simpler lyrics, and "Sheriff" became the first single, cracking the top 40, along with an extended dance version, but it was "How Do You Sleep At Night?" that caught the attention of radio stations, and its extended dance single version that tore up the nightclubs. The album went on to sell a quarter million copies while the band toured Canada and the US for the next year and a half, even doing a handful of shows in South America. Following the tour, the band switched to Lars Sorensen for management direction out of Seattle, who also guested on the song "Reach Out" on saxophone, the band made their way back to Phase One in late '83 to begin work on their follow up, 1984's VISIONS OF OUR FUTURE. Mele co-wrote three of the tracks and is credited for playing bass on "Getting Closer." But shortly after the recording began, he was replaced by Michael Beer. Again the band's focus was a light-hearted, not too sophisiticated pop approach with some slick production work from Gross. The only difference was this time CBS Records didn't mind spending a few dollars on production. "Something Else" hit the airwaves that summer and again put The Tenants in the top 40. But before a tour could ensue, legal hassles with Sorensen over unused money for the album's production caused a split. Though the record sold another quarter million copies worldwide, the band was held accountable for the missing money. This naturally caused strife among the members, and the band officially disbanded before the year's end. Gassyt, Beer and MacDougall later formed Moving Pictures, then they all went on their separate ways a few years later. McLean and Brown turned down a number of publishing deals, and Brown decided to retire all together and opened Certain Circles Recording Studios, as well as dabbling in managing other promising Toronto acts. 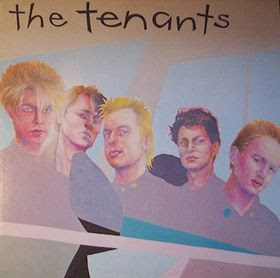 A few years later he recorded and shopped around some material labelled as The Tenants, although he was the only original member remaining, but got no serious offers.